Polybutylene Succinate (PBS) is also known as polytetramethylene succinate. It is biodegradable thermoplastic polymer resin of the polyester family. Polybutylene Succinate produced by the polycondensation of the succinic acid with 1, 4 butanediol monomers. PBS possesses the properties similar properties to that of Propylene. Polybutylene succinate remains stable even at high temperature to which It has several application in various segments such electrical & electronics, automotive, fiber, textile, packaging, making of non-woven and others. And it is widely used in Food Packaging industries. Global Polybutylene Succinate market is expected to grow at highest CAGR in upcoming years. The rising demand of the innovative packaging specially for attracting large number of consumers is anticipated to be dynamic factor for the rapid growth of the Polybutylene Succinate Market over the forecast period. Increasing demand of light weight automobile component is also expected to positively impact the growth of the Polybutylene Succinate Market. There is latest increase in the demand for the polybutylene succinate to produce the important electrical and electronic components. The growing plastic industry is expected to foster the overall demand for polybutylene succinate during the forecast period. Based on type Polybutylene Succinate is segmented into Automotive, Electrical & Electrical, Packaging, Textile, Others out of which Packaging is accounted for the largest market share in overall soft Polybutylene Succinate market over the forecast period. Polybutylene Succinate is majorly used for the packaging of food and pharmaceutical product. Rising demand of the smart packaging for the customer is one of the key factor fueling the demand of the Polybutylene Succinate globally. Advancement & Research activities in Packaging are anticipated to intensify the growth of the Polybutylene Succinate market across the globe. Moreover, rising demand of the light weight component of the automobile is anticipated to drive the growth of the Polybutylene Succinate market. PBS is also used in agriculture in the form of much film and is expected to trigger the growth of the Polybutylene Succinate market. . Moreover, government initiatives and wide policies towards the Polybutylene Succinate product is expected to positively impact the growth of the polymer conductive coating market during the forecast period. . 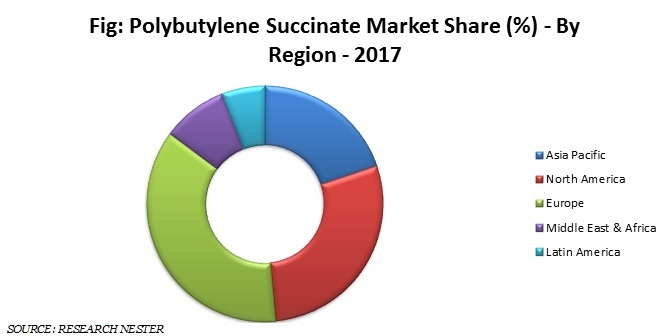 These market activities are believed to open a gateway of opportunities for the companies entering into the business of Polybutylene Succinate Market. However, succinic acid and 1, 4 butanediol are the monomers of Polybutylene Succinate which are produced by the petroleum feed stock. Fluctuation cost of monomers is expected to anticipate restraining the development of the global Polybutylene Succinate Market over the forecast period. PTT MCC Biochem Co., Ltd.